Step one: trimming the brisket. If you are unsure how to do this, refer to our post on How to Trim a Brisket for BBQ Competition. Trim half of the fat vein connecting the point and flat, and any fat on the top of the flat. Leave about ¼ of an inch of fat on the bottom side. Next, inject the brisket with beef stock mixed with a finely ground rub. Place the meat in a large pan to avoid spillage. Space the injections about an inch apart. Then season the brisket, covering both sides and making sure to get the rub into crevices and holes in the meat. Use a good amount of salt, black pepper and garlic powder. After injecting, place the brisket in a large zip lock bag. Pour the remaining injection in the bag too, and seal. Let the brisket marinade in a fridge for 5 hours or overnight. Time to smoke the brisket! Take it out of the fridge and drain the marinade off. Pat the meat dry with a paper towel and apply another coating of dry rub. 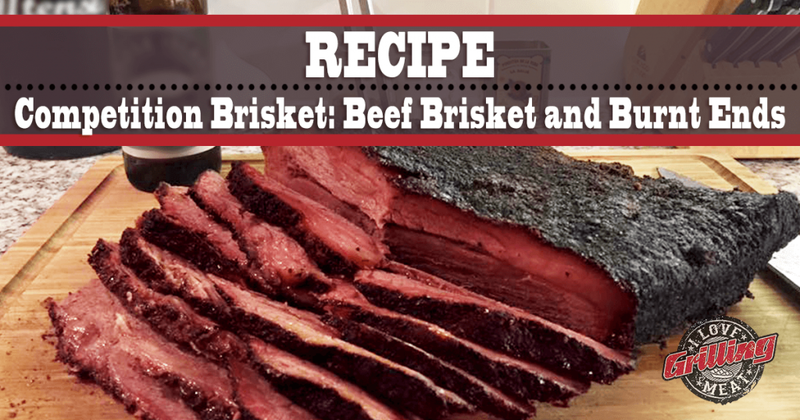 For this competition brisket recipe, place the brisket on a smoker preheated to 250°F. Check the internal temperature after 5 hours, it should be in the 160 to 170°F range range. Pull the brisket off the smoker and place it in an aluminum pan. Add ¼ inch of liquid (beef stock, apple juice, etc.) to the pan and apply a third layer of dry rub before covering the pan with aluminum foil an putting it back on the smoker. Check the internal temp 3 hours later. (the thermometer should go right through the meat, like sticking it in butter)Internal temp should be ~200°F. If it is lower, let it cook a little longer as needed. Once 200°F internal is reached, take the brisket off the smoker and open the foil to let the steam vent out. Then close the aluminum, wrap with a towel and place it in an empty cooler to rest for 1-2 hours. This will allow the brisket to tighten back up and absorb some of the drippings from the pan. To make burnt ends, you’ll need to separate the flat from the point. Simply take a sharp knife and cut down the fat vein. It will come apart with minimal effort. Return the flat to the aluminum pan and cut the point into chunks. Cut the point into 1 inch chunks. Place them in a small aluminum pan and toss in sauce (1 cup of BBQ sauce mixed with 3 Tbsp of the au jus from the large aluminum pan). Coat the burnt in pieces gently with this sauce and place back in the smoker for an hour (uncovered). Cut the brisket into the desired slices and place the slices in a small pan. In the pan you can mix 1 Cup of the au jus and 1 cup of BBQ sauce. Hmmmm…The description is different than the video. Hi! So do you let the whole brisket rest before separating for the burnt ends? About to try my first smoked brisket!!! 🙂 thanks!!!! !